This is the first time in my life that I am terrified of the coming winter. In the past, I’ve always welcomed the cooling temperatures and the fuzzy feelings of cold-weather nesting: lazy weekends under a blanket on the couch, steaming cups of tea, rich meat stews and red wine. But this year it’s different. I blame it on the last winter we endured. Non-stop subzero temperatures and snow storm after snow storm for weeks on end will traumatize even the most ardent fan of winter. And so I find myself grieving the loss of summer and contemplating, for the first time, how nice it would be to live in a place like Florida or LA. 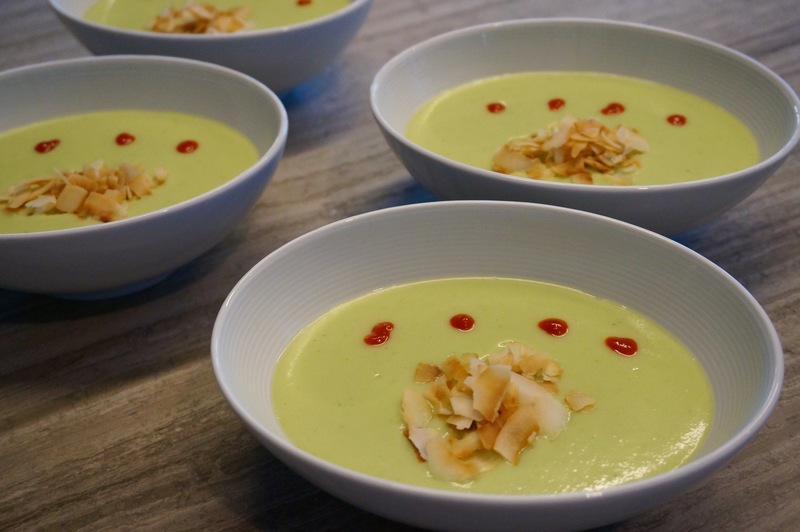 If you are feeling the same way, here’s a small way to briefly extend the summer: a chilled cucumber and avocado soup. I know that cucumber season is over but fortunately you can still find decent cucumbers at the store. And avocados seem to be available year round. The flavor of this soup isn’t very strong, so feel free to make it your own. Here, the recipe calls for some toasted coconut flakes on top and a few drops of Sriracha sauce. But you can use whatever makes you happy. A dollop of sour cream and chopped fresh dill would be fantastic. Add a couple of grilled shrimp and top it with some finely grated lemon zest and you have lunch. Whatever you do, it will help take your mind of the fact that winter is coming…Jon Snow! (sorry, I couldn’t help it). In a food processor, puree the cucumbers until smooth. Add the avocados, curry paste, sugar, and lime zest. Process until blended. Add 3 1/2 cups of water, the coconut milk and lime juice and process until smooth. Transfer the soup to a large bowl and season with salt. Cover and refrigerate until chilled. 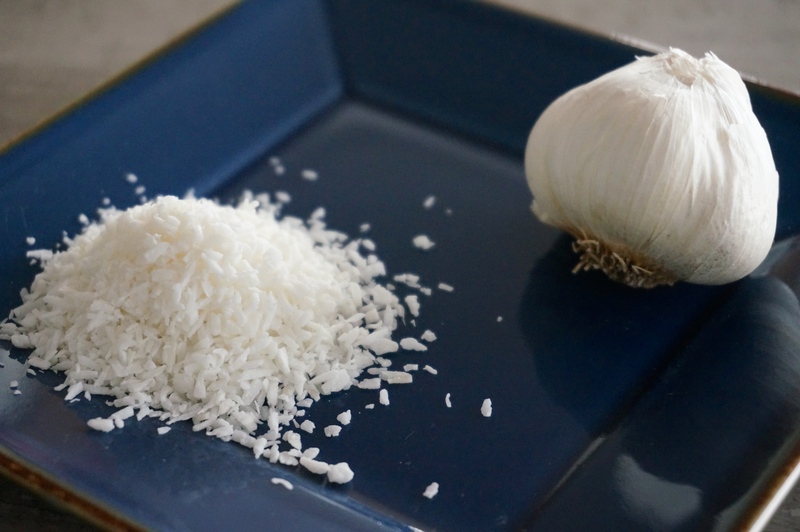 Ladle the soup into small bowls or cups, garnish with the toasted coconut flakes and Sriracha sauce and serve. And you know you live in the right neighborhood, when on Saturday you can just walk 10 minutes to the local butcher shop, where there are two butchers breaking down whole cuts of beef and pork, and you ask one of them for beef bones, and she, young, probably in her late 20s, her blond hair tied in a pony tail, puts down her knife, wipes her hands on her blood smeared apron, disappears in the walk-in refrigerator and comes back carrying a big box filled with 3-foot long beef bones. “How much do you want? I can cut them up for you,” she says. Sure, our apartment smelled like roast beef for days afterwards but in the end we were left with a beautiful beef stock, with a delicate meaty flavor, surprising really, given the heady, almost overwhelming smell of cooked meat the bones gave off while they were roasting in the oven, before we simmered them away in a large pot filled with water, carrots, onions, celery, bay leaves, and peppercorns. The stock is now in the freezer, in one-cup portions, ready to be used for any recipe that calls for stock. Like today’s Thai-style soup. 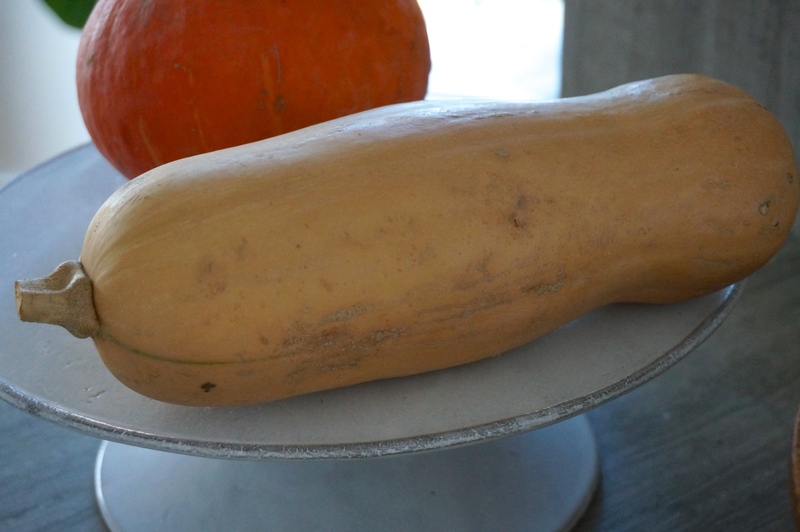 The squash season is almost at an end, but you can still find butternut squash in the stores. 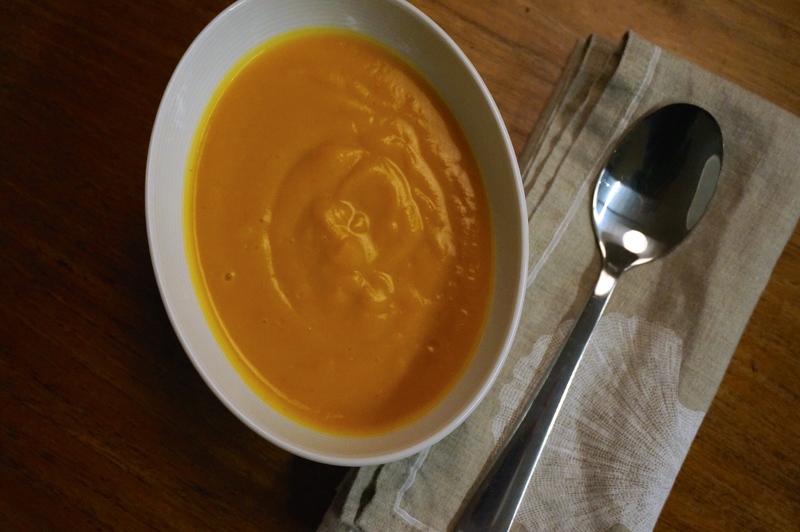 This is an easy recipe to make, similar to the roasted butternut and coconut soup that I’ve posted here before, but without the coconut and with a much stronger Thai character, thanks to the lime juice, fish sauce, rice vinegar, and thai chili pepper used in it. Use any stock you have in hand (chicken, beef, or vegetable). Or go find some bones and make your own. It’s worth it. Preheat oven to 425° F. In a large bowl, toss together squash, oil, salt, and pepper. Spread on large baking sheet and roast in oven for about 45-50 minutes, until squash is cooked through and edges are dark brown. Let squash cool slightly. 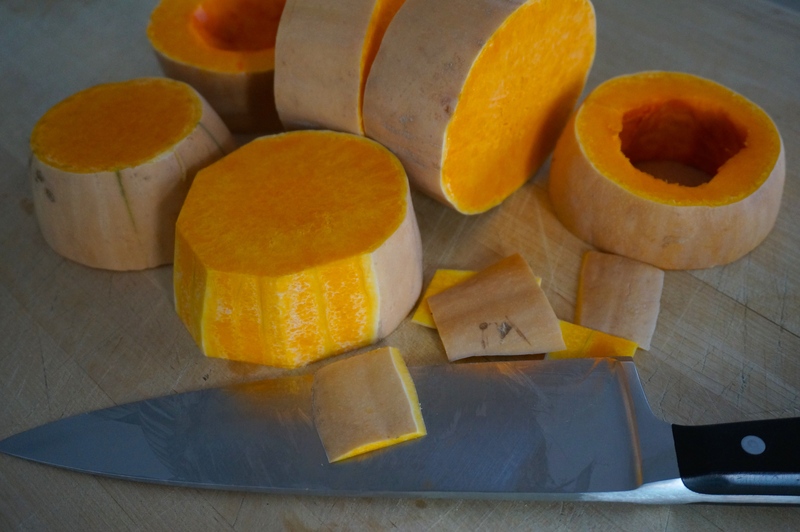 In a blender, add roasted squash and all of the remaining ingredients. Blend until completely combined and smooth. Pour in a medium sized pot and warm over medium heat. Serve in bowls on its own, or topped with a dollop of crème fraîche or sour cream. When I was a kid, I remember my mom telling me that as she got older, she started remembering things from her childhood that she had thought she had completely forgotten. It seemed that some memories were like fermented foods, stored away and left to mature over time by themselves until the time was right to unveil them again. As a kid, this didn’t really make a lot of sense to me. But now that I am doing my own older-getting, I understand what she meant. Flashes of memory will pop into my head unexpectedly. They are often little things. Unremarkable events and ordinary days from many years ago. And sometimes these memories carry their own smells. Like the smell of charred corn on the cob, for example. It’s always tied to my memories of trips we took to see my aunt’s family, who lived closer to the sea. As we drove back in the evening with our windows rolled down, the car would fill with the smoky, sweet smell of corn cooking on coals. There were always vendors selling it on the sidewalks and sometimes, my dad would stop the car and buy some for us. I burned my tongue many times on that corn. It was impossible to wait for it to cool down. Roasting chestnuts is another one. I grew up without central heating. We had one portable gas heater that we huddled around in the evenings as we watched TV in the living room. Sometimes, my parents would buy fresh chestnuts and bring them home. I remember my dad would score the tops with an X and then put them on the top of the heater. 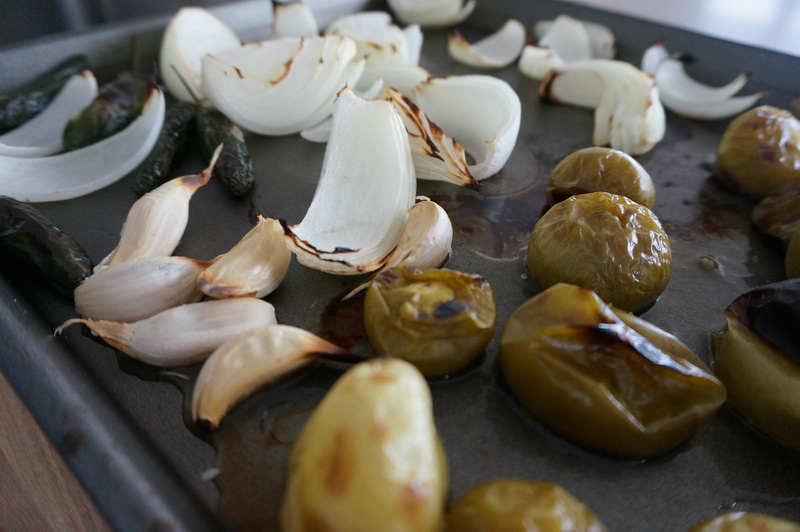 Their smell as they roasted would fill the room and my sister and I would wait breathlessly for my parents to take them off the heater, blow on them to cool them down, and peel them for us. 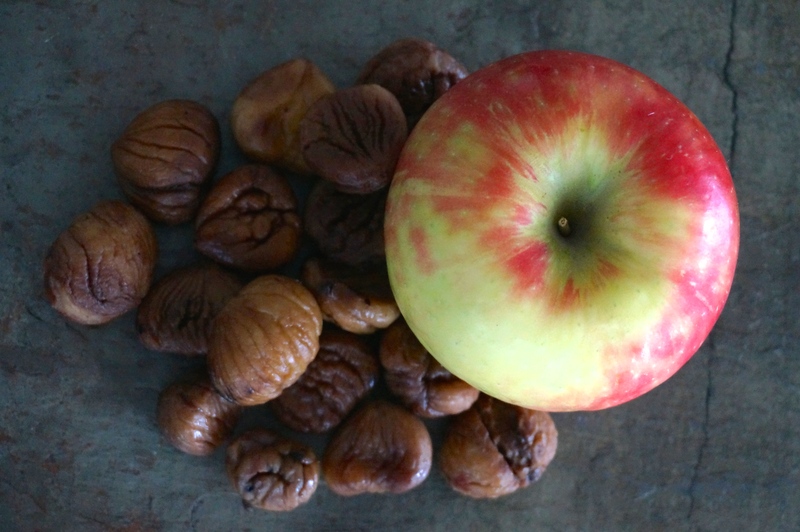 The sweet and nutty flesh was as good as candy. Melt butter in heavy large saucepan over medium heat. 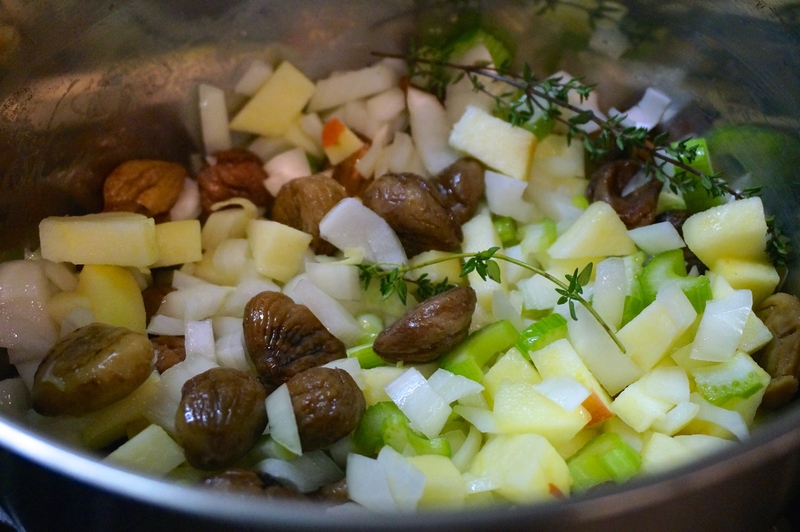 Add onion, apple, chestnuts, celery, and thyme sprigs. Sauté until onion is soft and translucent, about 7 minutes. Add brandy; stir until liquid is absorbed, about 1-2 minutes. Add 3 cups broth and bring to boil. Reduce heat to medium and simmer until chestnuts are soft, about 15 minutes; cool slightly. Remove and discard thyme sprigs. Working in batches, puree soup in blender until very smooth. Return soup to pan and cook until heated through, adding more chicken broth by tablespoonfuls to thin as needed and stirring often, about 2 minutes. Season with salt and pepper. 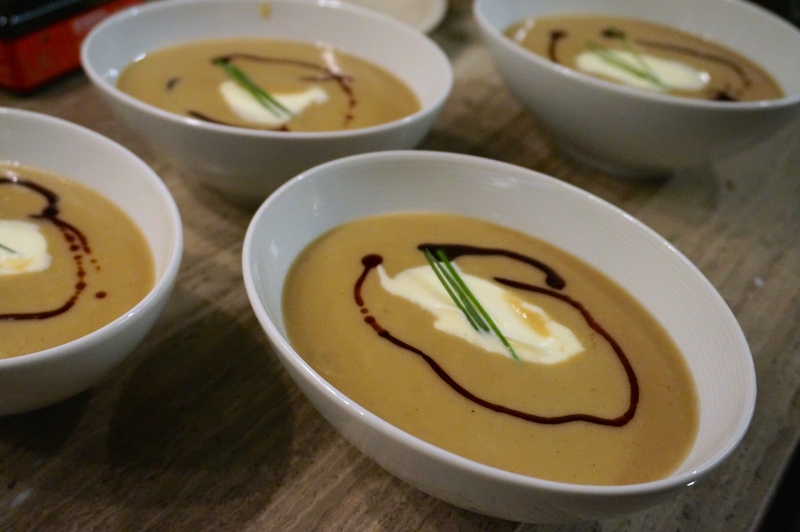 Divide soup among bowls. Top with dollop of crème fraîche and drizzle with pumpkin seed oil. Serve immediately. It’s not often that Steve and I are surprised by a totally new flavor or combination of flavors. It’s one of the downsides of being an adventurous omnivore. The more things you try, the fewer things surprise you. So when it does happen, when we try something really new and unexpected and we love it (because sometimes “new and unexpected” can also be terrible), we always try and recreate it at home. Sometimes, it proves impossible. Like the time when we were exploring Brittany in France and we stopped in a small seaside town for lunch. Steve ordered a seafood soup that was so unusual in its flavor profile, while also so satisfying – in a ‘feeding your soul’ kind of way – that we’ve spent the last five years trying to recreate it, never even coming close. But sometimes, we get lucky. Several years ago we visited for the first time an amazing Spanish tapas restaurant in New York called Tia Pol. We have since returned many times but on that night, we discovered for the first time the deep intensity of smoked paprika and the excitement of fried shishito peppers with sea salt. 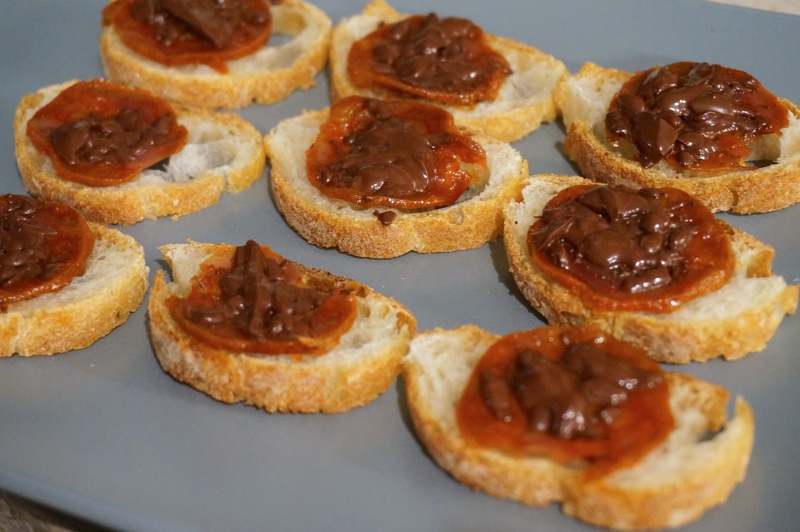 But it was this dish that surprised us the most: little slices of bread topped with thinly sliced chorizo and topped with melted dark chocolate. It was unexpected, new, and utterly addictive. There’s really no recipe for this but if you need one here it is. Cut the baguette crosswise into 1/2 inch slices. Arrange slices on a cookie sheet or baking pan. Top each slice with one slice of chorizo. Sprinkle chocolate on top of chorizo. Place in oven until the chocolate melts (this could take anywhere from 30 seconds to 3-4 minutes; keep an eye on them so they don’t burn). Serve immediately. 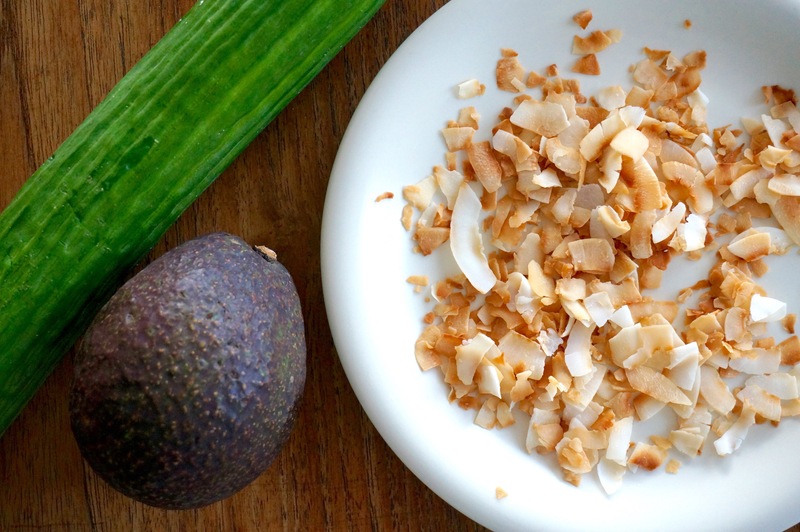 I pulled up the list of all the drafts of yet-unpublished posts for this blog, and I saw that there were five recipes that featured coconut. I’m not sure how that happened. Don’t get me wrong, I really like coconut, but it’s not the first thing I go for on a menu. I’ll blame (or thank) the dead zone. This period we are in when it’s not winter and it’s not spring. When I avoid going to the farmers’ market because it makes me sad to see all those withered apples and dried up squashes (though it’s probably when the farmers need me to buy their things the most, now that I think about it). So I turn to things that are without season. Like dried beans and grains and shredded coconut that’s always available at the store. I also realized that I’ve neglected the Appetizers section of this blog. It’s not an easy section to fill. Most of the time, I’m cooking for just the two of us, so there’s no appetizer involved. I have to wait until I’m cooking for company to bring out my list of appetizer recipes. For this recipe, I reached out to a cookbook I have had for probably close to 15 years. I used it a lot when I first bought it back in the 90s but then it got buried somewhere in the back of the bookcase. It’s a great cookbook on Indonesian food called Taste of Indonesia: Over 70 Aromatic Dishes from the Spice Islands of Bali, Java Sumatra and Madura by Sallie Morris. It has big, beautiful photographs and recipes that are not hard to make, though they do sometimes require searching for some exotic ingredients like galangal or pandan. This recipe for coconut beef patties, however, is easy to make with things you probably already have in your pantry. 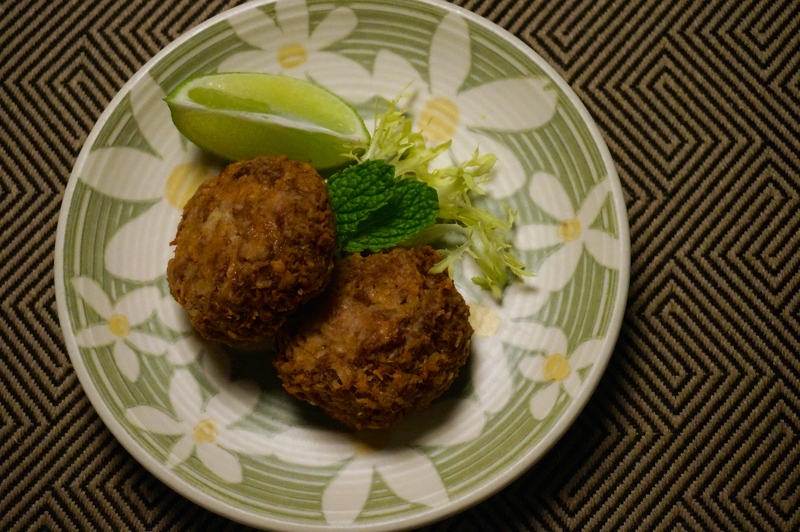 The patties are lightly spiced with coriander and cumin and they carry a distinct coconut flavor. They remain, however, steadfastly meaty. 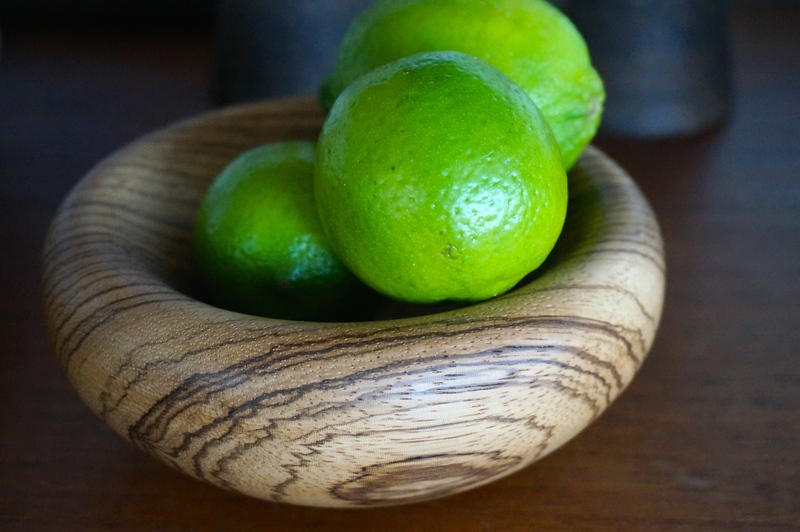 When you serve them, make sure you provide lime wedges for your guests to squeeze over them. They need the acid. Or if you want to go a step further, serve them with a small bowl of Thai chili vinaigrette to dip the patties in. Just call it Thai-Indonesian fusion. In a small bowl, mix together the coriander, cumin, salt, and garlic into a paste. Add to the soaked coconut and mix to combine. Add coconut mixture and egg to beef and use your hands to combine. 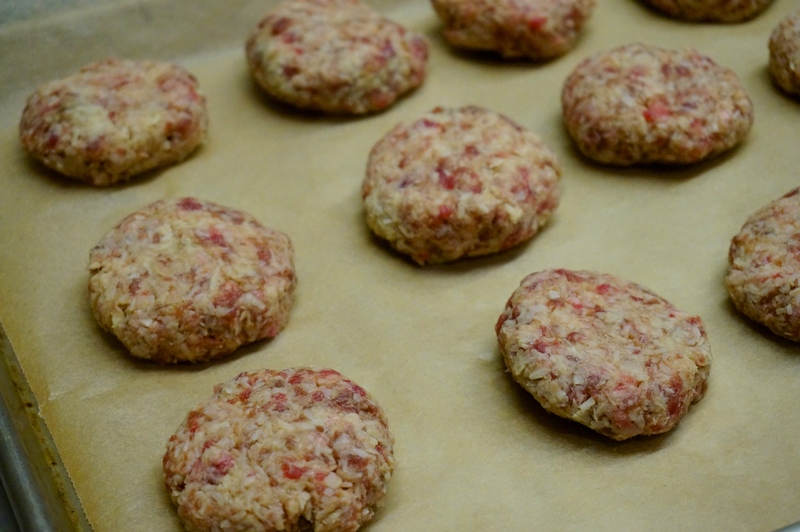 Divide the meat mixture into 10-12 even sized portions and form them into patties about 2″ in diameter and ½” thick. Dust both sides of patties with flour. Put enough oil in deep sauté pan to come to about ½” deep. 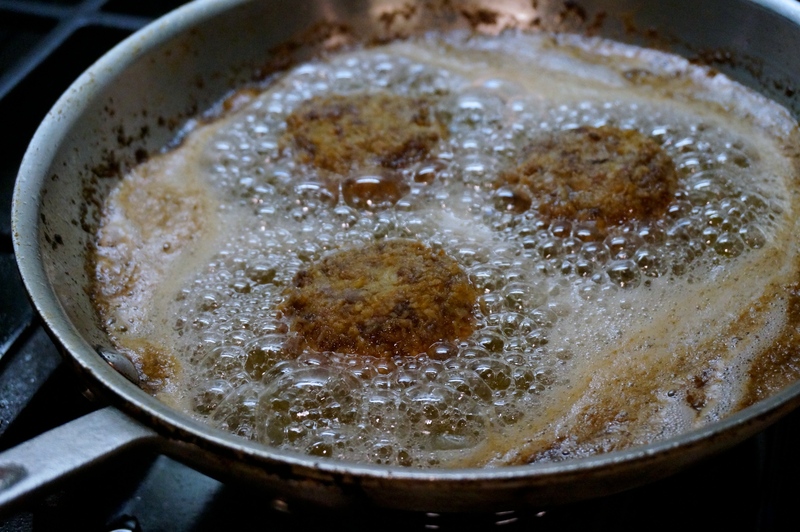 Heat oil over medium high heat to about 350° F. Fry patties in batches for about 3 minutes on each side, adjusting heat to maintain oil temperature, until cooked through and both sides are golden brown. Do not crowd patties in the pan. Serve immediately with lime wedges to squeeze over. Thanksgiving is one of my favorite holidays. I love that it’s a holiday that celebrates something really positive and universal: being thankful for all the good things in your life. How wonderful is that? Coming from a culture where every holiday is either religious or celebrating a bloody war of some kind, I immediately embraced Thanksgiving when I came to the U.S. When I was a young college student in the U.S., my new American friends invited me back to their homes to celebrate Thanksgiving with their families. This was such a generous gesture, it made me love this country and want to be a part of it even more. I realized what actual hospitality is, when parents, who hadn’t seen their kids in months, went out of their way to make me feel comfortable and welcome in their homes during a holiday that is so family-centered. And then there’s the food. Thanksgiving introduced me to many new and amazing delights, like cranberry sauce and pecan pie. It also introduced me to some food traditions I never quite learned to like, like pumpkin pie and sweet potato pie, both of which I find strange (who wants dessert made from a side dish?). Over the years, I’ve cooked many Thanksgiving meals and have invited friends and strangers to share them with me. For the last several years, Steve and I have had our own tradition. We have our Thanksgiving in Paris, where we cook a traditional meal for all of our friends there. We get the turkey from a neighborhood butcher who cooks it for us on the rotisserie. We make everything else, including a traditional dish from Steve’s family called under-the-sea salad, a concoction of cream cheese, lime jello, and canned pears that only an American could come up with. 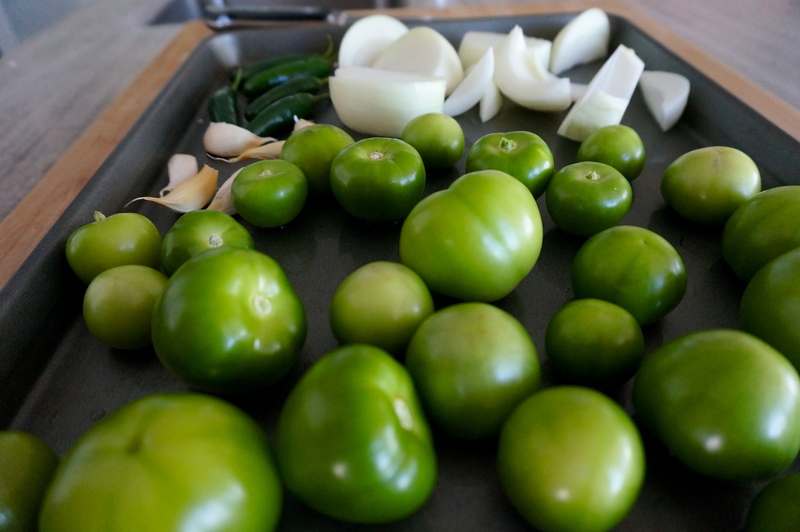 I don’t have that recipe for you today, but I do have a recipe that Steve makes for roasted tomatillo salsa. It’s perfect for snacking on while everyone is waiting for the turkey to finish, or while they are playing video games or watching football in the living room. The photos and preparation of this recipe post were all done by Steve. 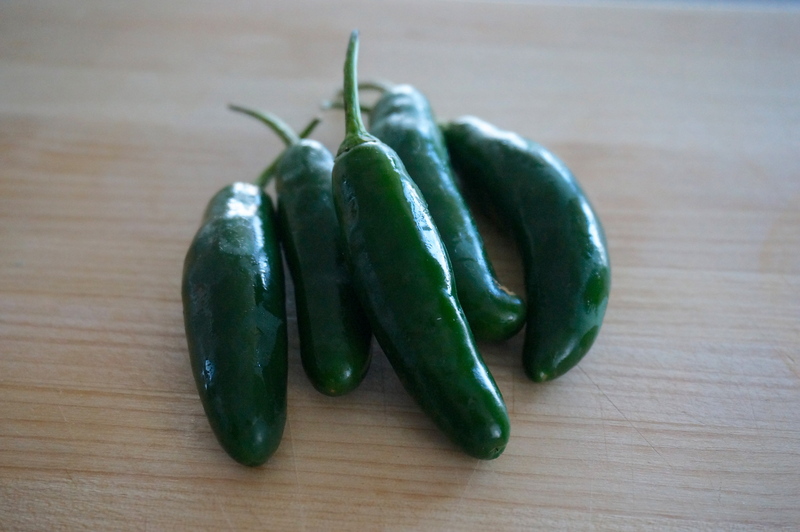 Peel garlic and pull off tops of chiles. Put all ingredients in a blender, including cilantro, salt, and lime juice and purée. 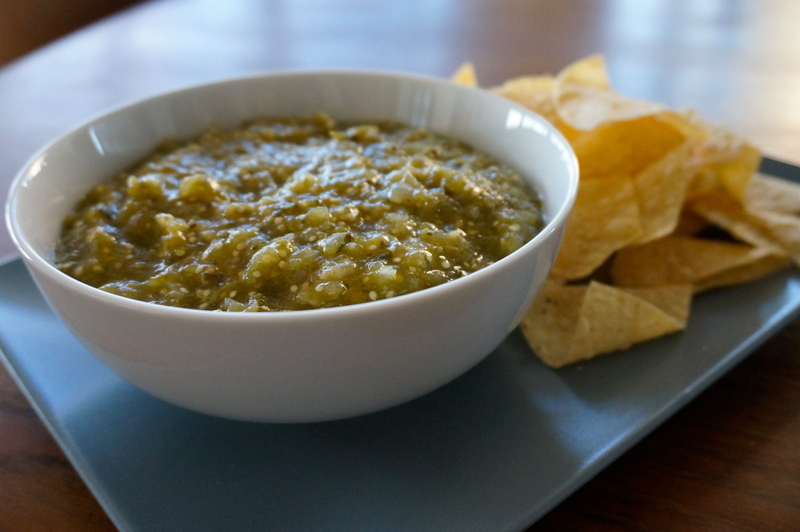 Chill in refrigerator and serve with tortilla chips.